If you're a memorabilia collector, then have I got an item for you. Game-worn jerseys are far too rich for my blood (but I have two Carbo game-used sticks and Carbo's rookie game-worn skates, which I think is pretty decent!). It is my dream to own one someday. 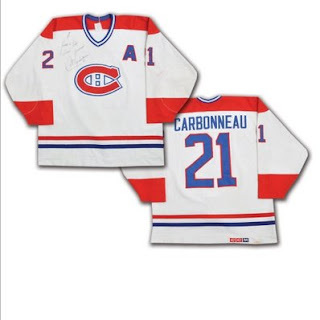 The latest Classic Auction has Carbo's autographed game-worn jersey circa 1988, hammered with team repairs. Like all of Carbo's game-worn jerseys, it is a work of art and a real beauty.